HBM is the reference standard in different national institutes and accredited calibration laboratories. HBM offers reference transducers and high precisions amplifiers. The Accelerometer Calibration Workstation Model 9155 offers accurate back-to-back comparison calibrations of ICP® (IEPE) and charge mode piezoelectric accelerometers in accordance with ISO 16063-21. The SoundAdvisor Audiometer Calibration System AudCal is a field- ready solution. It combines the power and versatility of the SoundAdvisor 831C sound level meter with the accessibility and functionalityof the LD G4 Utility Software. AudCal works seamlessly with a tablet for both testing and data collection–no PC is required. Ideal for checking accelerometers, velocity transducers and proximity probes over a wide frequency and amplitude operating range, the Modal Shop 9100D Portable Vibration Calibrator is rugged throughout, with simple and elegant usability and robust internal components. 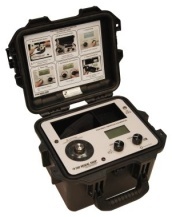 In contrast to more elaborate laboratory style systems, the 9100D is a portable vibration shaker and calibrator, making it perfect for testing in the field or at a customer's site. 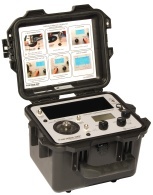 The 9110D is a compact, battery-powered and completely self-contained vibration reference source which can be conveniently used to calibrate individual sensors, vibration switches, as well as to validate the entire measurement channel.